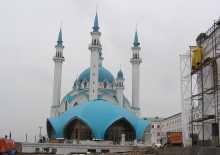 The biggest mosque in Russia opens on 24 June in Kazan as part of festivities marking the city’s 1,000th anniversary. The rebuilding of the Qol Sharif Mosque began nearly 10 years ago. Its opening prayers Friday will be one of the main events during the Tatarstan capital’s celebrations. RFE/RL correspondent Bruce Pannier and RFE/RL’s Tatar-Bashkir Service report. Prague, 23 June 2005 (RFE/RL) — Thousands of Muslim faithful are waiting for the opening of the Qol Sharif Mosque, but the celebrations have already begun. People have traveled from throughout the former Soviet Union to witness Imam Ramil Yunusov’s opening of the mosque at the Kazan Kremlin. Organization for the Islamic Conference Secretary-General Ekmeliddin Ihsanoglu, Kuwaiti Minister for Islamic Affairs Abdullah Ma’tuq al-Ma’tuq, the Iranian ambassador to Russia, and a representative of Russian President Vladimir Putin are among those due to take part in the ceremony on 24 June.